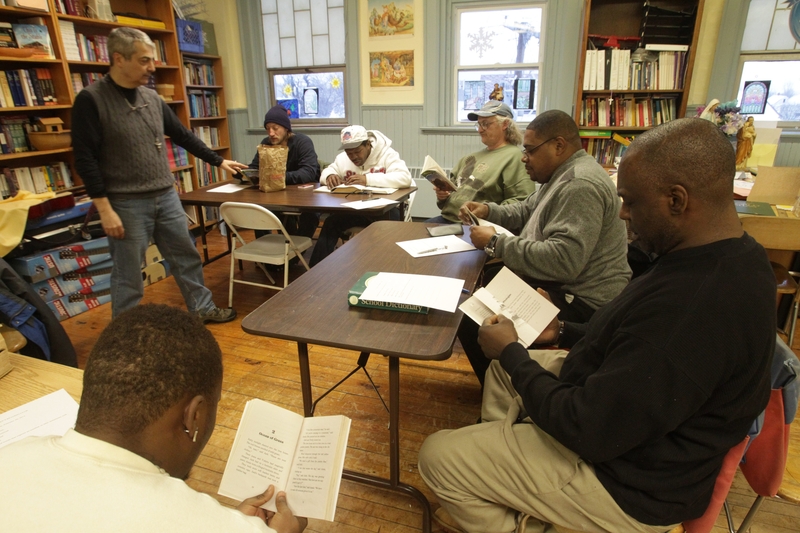 Mike Taheri teaches group of men to read at St. Luke’s Mission of Mercy in Buffalo. The adult reading group is helping many people who have struggled in their lives because they have very little education. The words taunt Sam Tillman from the page in front of him. This work is hard; it always has been. Tillman cautiously sounds out the words of a story more apropos for a fourth-grader than a 46-year-old. He is nervous and self-conscious. Frustration sets in, just as it has before. He’s tempted to put his head down on the desk, or even to just walk out the door. He did that the last time – and it got him nothing but stabbed, shot and jailed. This time will be different. This time the stakes are higher. The reading group for adult men is the latest mission offered at St. Luke’s Mission of Mercy, which for years has offered food and clothing to the poor on the city’s East Side. It also operates a school. Tillman, who has grandchildren at the school, was inspired to start the adult reading group at the beginning of this year when he saw how his kids were benefitting from their education. These reading lessons are just as much for his children and grandchildren as they are for him. And if he can stick with this task, he might even set an example for others in the East Side community where he lives. Tillman and the other men pass by these shelves as they head up the stairs to a room typically used as a middle school classroom. Colorful posters cover the walls, and tennis balls hug the legs of the chairs to protect the floor from scratches. This is where they will resume their education. “The more I learn, the better I become,” said Edward “Cricket” Anderson. Some of these men never made it to high school. Others never made it out. Those who did finish high school barely made it across the stage at graduation, followed closely by the ghost of their absent literacy skills, which still haunts them decades later. Donald Irvin graduated from Kensington High School and then took classes at Erie Community College until his reading struggles overwhelmed him. “I got frustrated and left,” he said. The specter finds others as they try to complete simple tasks most others take for granted, like applying for jobs or ordering food at a restaurant. The night of the book club’s first meeting, some of the men are incredulous. They’ve all been in classrooms like this before, but those times even their best efforts failed them. Like too many others – and many young men today – they fell through the cracks of a broken education system. The group’s leader, Mike Taheri, hands each of them a book, the set borrowed from a friend who is an elementary school teacher. Volunteer Marty Haumesser pulls out a large dictionary so they can look up the words they don’t recognize. “Are we reading that?” one of the men asks with a shocked expression. Word by word, page by page, they take turns reading through the text. Taheri stops them regularly to assess how well they understand the words and the meaning of the passages. It’s a slow process. Some nights they only make it through a few pages in an hour. But they’ve already waited this long – decades in some cases – to improve their reading. The men’s reading group was Tillman’s brain child, inspired by his own experience going back to school to get his GED. Tillman had tried going back to school before, but he quit each time in frustration. But that stress paled in comparison to what he felt the night one of his grandchildren asked for help with his homework. That made Tillman feel like the boy back in school who wouldn’t raise his hand for fear of being embarrassed. The boy who saw more hope for his future on the streets than struggling in the classroom, even though those streets brought mostly trouble. He got caught up in gangs, fighting and violence, was both shot and stabbed, and did time in jail for assault. His attitude started to change about 20 years ago when he first came to St. Luke’s, off Walden Avenue, looking for food and refuge. Eventually he became a missionary there, helping out with security. Now, he also comes for an education. The group adjusts its format as the men become more comfortable with each other, each week adding a challenge to the curriculum, such as standing up to read in front of the group and writing out sentences. They put aside their own insecurities to encourage and support one another. “You did good,” Lapointe tells a fellow book club member one week. The weeks bring new members, but for some, the temptation to leave proves too great. One young man doesn’t know where he will stay the night. “Wherever Jesus takes me,” he tells Taheri. He comes one night but doesn’t return. Another transient plans to stay in town just long enough to collect his next paycheck. Then he’ll have the money to leave the city. But the door is always open for them and for others to come back, just as Tillman did. Tiffany Lankes – Tiffany Lankes joined The Buffalo News in 2013 and primarily covers the Buffalo Public Schools. She has written about education since 2003 at newspapers in Florida and New York. In 2008, she was a nominated finalist for The Pulitzer Prize. Lankes is an Amherst native and graduate of Sacred Heart Academy and Syracuse University. She started her journalism career writing for the News’ NeXt section.